Saturday April 20th 1878 Mother and I got the work done up this forenoon. She went to town in the afternoon and I sewed for the little girl. Mamie Wilde was over to play with her. I made her a little dress in the evening. Sunday April 21st 1878 It took Mother and I nearly all day to do the work. I wrote some in my diary in the evening and a letter to Will Reed. We had a severe hail storm this evening. I did not to go to church at all today. 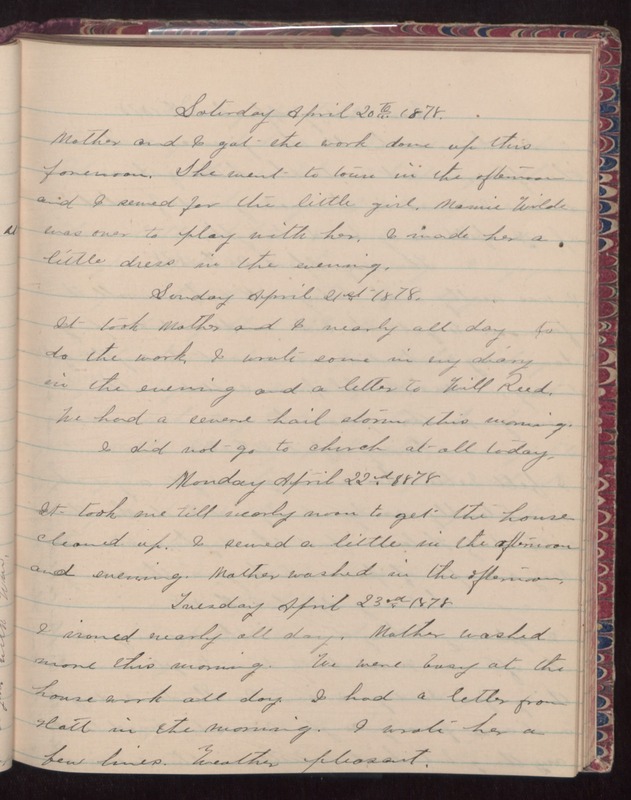 Monday April 22nd 1878 It took me till nearly noon to get the house cleaned up. I sewed a little in the afternoon and evening. Mother washed in the afternoon. Tuesday April 23rd 1878 I ironed nearly all day. Mother washed more this morning. We were busy at the house work all day. I had a letter from Hatt in the morning. I wrote her a few lines. Weather pleasant.